REAPER, a popular music production tool, added experimental native Linux builds to its download page with the latest 5.93 release. 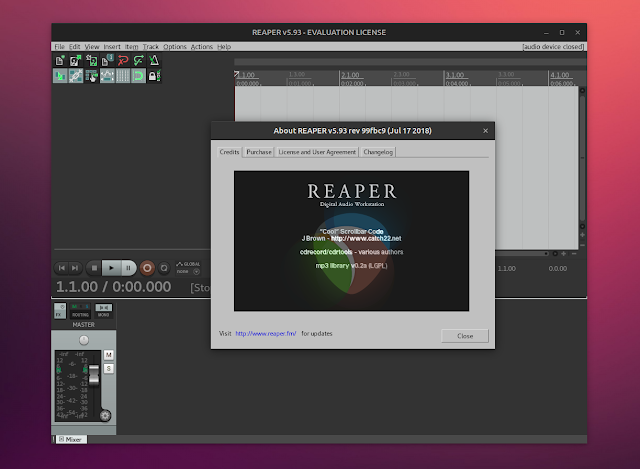 Initially released in 2005, REAPER (Rapid Environment for Audio Production, Engineering, and Recording) is a powerful digital audio workstation (DAW) and MIDI sequencer, available for Windows, macOS and Linux. Cockos, the company that develops REAPER, was founded by Justin Frankel of Winamp and Gnutella peer-to-peer network fame. The application uses a proprietary license and you can evaluate it for free for 60 days without having to provide any personal details or register. After the free trial ends, you can continue to use it but a nag screen will show up for a few seconds when the application starts. A license costs $225 for commercial use, or $60 for a discounted license (details here). Thousands of third-party plugins for effects and virtual instruments, including VST, VST3, AU, DX, and JS. The music production tool even supports video editing (trim video files and edit or replace the audio in a video file), although it's not a dedicated video editor. For a complete REAPER feature overview see this page. On Linux, REAPER is available for i686, x86_64, and armv7l (Raspberry Pi 2+) architectures. The Linux binaries come with an installation script that can install the application in /opt or a custom location, and can automatically create a desktop file to include REAPER in the menu / Dash. Linux requirements for REAPER include libstdc++ for gcc 4.x or later, libgdk-3, and ALSA. If the text looks broken, install the DejaVu or Cantarell fonts.